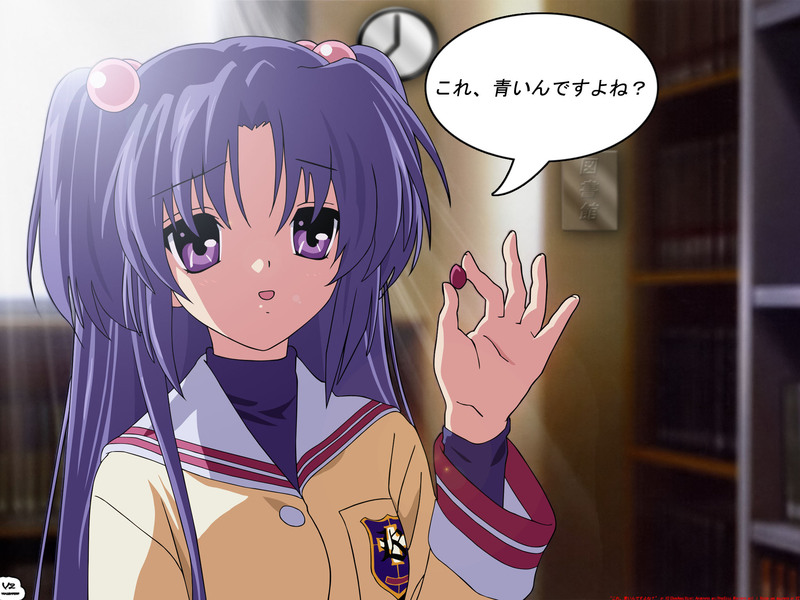 Clannad Wallpaper: "This is blue,right?" Minitokyo »	Clannad Wallpapers » Clannad Wallpaper: "This is blue,right?" Okay,this was my latest Wallpaper and Vector which I finished at 17-10-08,Friday. The vector takes about 9 hours to finish and the wallpaper takes 1 and half an hours. The Vector consists of 31 vector layers. - Wooden Board : The wooden board on the right side. - Wooden Board Glass : The Glass-like effect on the board. - Clock Glass : The Glass-like effect on the clock. - Original Kotomi : The original from the scan,it's been made hidden. The Light Beams are brushes,while the others(Clock and Wooden board,etc) are made using custom shape,styles and other basic techniques. And finished it at last.At first I want to make an abstract background,but when I think about it again,that's too...usual,so I guess I'll just use the background from the scan and add somethings,like the talk bubble,the light,and the wooden board. Please full view for maximum detail. Huh? You're back from graveyard? But, with this, it's that mean you're back again, ne? kotomi and yuki are the best anime girl geniuses.